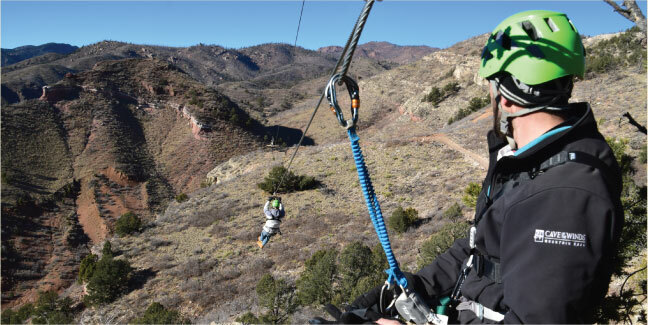 Try out our two zip lines totaling over ¼ mile long and 80’ above the canyon floor! Zipping at Cave of the Winds Mountain Park is our newest addition to our aboveground adventures! The Zip line is a part of the Via Ferrata Canyon Tour, but can also be purchased separately. Requirements: Zip line riders must be at least 12 years old and ages 12-17 must be accompanied by an adult. The minimum height to ride is 48 inches and the maximum height is 6 feet 6 inches. The minimum weight to ride is 90 pounds and the maximum weight is 250 pounds. You won’t need nerves of steel for the Via Ferrata at Cave of the Winds Mountain Park. What you will need is an adventurous spirit for outdoor climbing fun! Created in the mountains of Europe, the Via Ferrata is a system of cables and ladders that helped World War 1 soldiers navigate the front line between Austria, Hungary and Italy! You will be connected to our Via Ferrata track cable for an exhilarating climbing activity through spectacular mountain terrain on a guided tour under the close supervision of our experienced guides. Our knowledgeable guides will lead you around limestone cliffs and mountain paths high above the canyon floor. The excitement of vertical canyon walls and amazing views will make for a perfect Colorado Adventure! Our course is geared toward the inexperienced climber. Our safety equipment is designed to keep you on course. Each climber will be provided with a specially designed Via Ferrata harness system, helmet and gloves. You must wear sturdy hiking /climbing footwear. Requirements: Participants must be 48″ tall and weigh between 90 & 260 pounds and must be ages 12 and up. Guests 12-17 must be accompanied by an adult. What should I bring for a Canyon Tour? You must wear sturdy hiking/climbing footwear. MEET THE WINNER OF OUR 2018 HOW DEEP IS YOUR LOVE VALENTINE’S DAY CONTEST! Read Angelica’s winning story below! Nick and I grew up in Houston, Texas. We have known each other since we were in 4th grade. We attended the same elementary school, middle schools, and high school growing up. We even “dated” in middle school when we were in band together. You know how those middle school crushes go. But I like to think that even way back then, we knew that there was something special about each other. I did end up moving away in high school and we lost touch. Not for long though. We both ended up attending Texas A&M for college. On a campus of over 60,000 students and being in completely different areas of study, we somehow managed to run into each other quite a bit. The first time we ran into each other we had not seen each other for at least three years. I still turn red when I think back on it. I had just finished a biology lab exam and was furiously pedaling on my bike when I saw someone waving at me from the corner of my eye. It took me a bit before I recognized him. It was Nick! He looked quite different since I saw him last and let’s just say, I liked what I saw. I was so taken off guard I nearly ran him over. This allowed us to re-connect. After many study dates (more talking and catching up than studying if we are being honest), evening walks, and movie nights, Nick eventually got the courage to finally admit that he had still had feelings for me over the years and other relationships along the way. No one else had given him the same excited feeling and connection he felt with me. Luckily, the feeling was mutual. In his typical romantic style, Nick asked me out at a nice restaurant where we were greeted with champagne, flowers, VIP seating and a question at the top of my menu: “Angelica, will you be my girlfriend?”. How could I say no, right?! Fast forward three and half years and we found ourselves as college graduates. I was working full time in Houston at a genetics lab and Nick was all over the country for Army training. We started to feel the stresses of life and were wondering where our relationship would go from there. I joined Nick on a road trip from Arizona to Colorado Springs to his first duty station at Fort Carson. We decided to take it as an opportunity to visit the Grand Canyon and other national parks in Utah. One beautiful day, as we were hiking the Narrows at Zion National Park, he popped the question as we posed for a picture on top of a rock! I was completely surprised (as you can see in the picture)! I was completely blown away. It was perfect timing for us and will always be one of the best moments of my life. I moved to Colorado Springs in August of 2016 and we got married at the end of September. I absolutely fell in love with Colorado Springs because of all of the amazing outdoors activities and spectacular views it has to offer. I cannot wait to get back there after I graduate! Since I moved to Houston last August for school, we have tried to keep the flame burning strong despite the distance. I would be so appreciative if you could help me make sure these last couple days we have together will be extra memorable for him to think back on when he is missing home! Fall is such a busy time of the year for all of us! The kiddos are busy with school and activities, the holidays are approaching and the weather is changing. We can all appreciate the cooler nights and beautiful crisp days and all of the spectacular views here in Colorado. 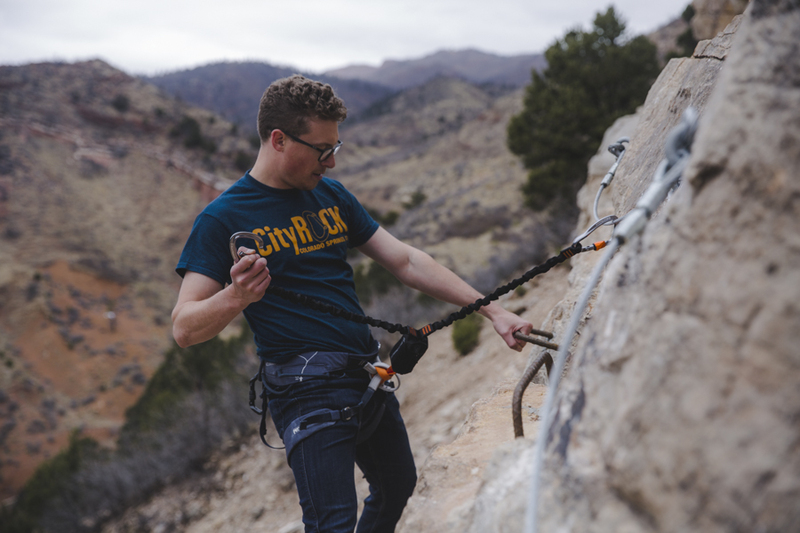 When you visit Cave of the Winds Mountain Park, just 10 minutes from downtown Colorado Springs, you’ll see some of the most impressive views in the region. The property is home to a host of outdoor activities, including the exhilarating TERROR-dactyl! With three cave tours to choose from, it’s a toasty 54 degrees year-round and the park is open 364 days a year. Cave of the Winds Mountain Park is a must see for travelers and neighbors alike! Center Stage: The Golden Eagle! 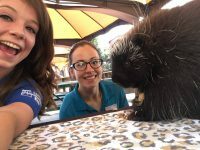 Extra fun visit from the Nature and Raptor Center at Cave of the Winds Mountain Park! Many thanks to our feathery friends and the Nature and Raptor Center for a wonderful visit at Cave of the Winds Mountain Park! Thank you for the good work that you do in education, conservation, recreation and environmental stewardship! The Colorado Birds Of Prey Event Returns to Cave of the Winds Mountain Park on August 19th! Cave of the Winds Mountain Park is excited to welcome back the Nature and Raptor Center of Pueblo for our BIRDS OF PREY event on Saturday August 19th from 11 a.m. to 2 p.m. Mark your calendars to get up close and personal with these big beautiful birds! Cost: FREE! 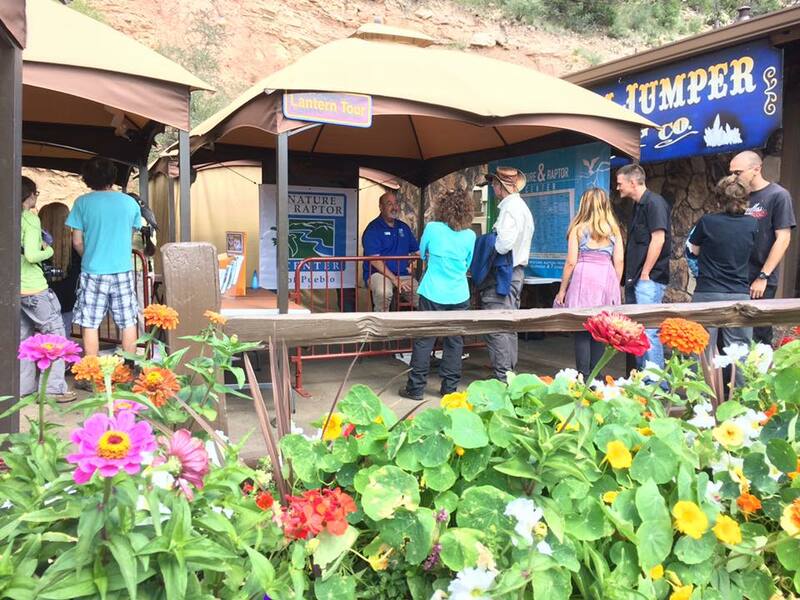 NEW Outdoor activities at Cave of the Winds Mountain Park are a big hit with families! Cave of the Winds Mountain Park has added three new outdoor activities this summer. Geronimo’s Leap, Cliffhanger Climbing Wall and the Stalactykes Adventure Slide are the new activities that have been keeping kids of all ages busy and having a blast, all summer long! “We ended up spending more time there than planned we had so much fun.” said one guest who took a cave tour and had some fun outside. Tickets are available through the website at https://caveofthewinds.com/ and the tickets include all of the new additions plus the Bat-A-Pult and the Wind Walker! Laser Light Show – See it this summer! June 10 – August 13, 2017 at 9 p.m., Nightly! Cave of the Winds Mountain Park Laser Light Show is the perfect ending to a fun day! Stay with us until dark when the canyon lights up for a stunning light show experience. The FREE show begins at 9 pm and lights up five stories of canyon walls that surround Cave of the Winds Mountain Park. With the Colorado Springs skyline in the background, this laser light show is sure to be a crowd pleaser! Nightly June 10 – August 13th, weather permitting.